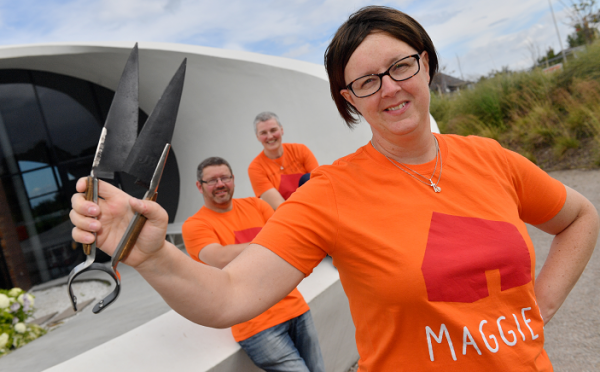 Angela Findlay shears in hand (front) with her husband Scott Findlay who was waxed and Fiona Walker who had her head shaved to raise funds for Maggie's. An Aberdeenshire teacher, who survived a battle with breast cancer and then was diagnosed with a golf ball-sized brain tumour has helped to raise more than £5,000 for the charity which helped her during her darkest hours. Angela Findlay lives on a farm near Echt with her husband Scott and two children Morven and Cameron. She first discovered she had abnormalities in her right breast last March. Mrs Findlay finished her chemotherapy treatment last September, and thought she was on the road to recovery when she collapsed in January. After she was taken to Aberdeen Royal Infirmary, doctors said she would require brain surgery to to remove a tumour two inches across and one-and-a-half inches wide. She said: “I went to the doctor, and because he knew I had breast cancer before, he didn’t take any chances and sent me to hospital for a CT scan that day. “We went home, and I was feeling fine, and had another scan a few days later. “But, a few days after that, I got the call and was told I had a brain tumour. “Often you get breast cancer and you get a secondary tumour, so I couldn’t believe that it was a separate, primary tumour. In March, Mrs Findlay had surgery which removed around 95% of the tumour tissue, but she still has many more months of painful chemotherapy to go through. During her two cancer experiences over the last year Mrs Findlay has been able to rely on the Maggie’s Centre at ARI, which has helped her and her family. To thank Maggie’s for their support, Mrs Findlay’s husband and her friend Fiona Walker raised £5,264 by getting their bodies waxed and heads shaved at July’s Echt Show. Mrs Findlay, 43, added: “Maggie’s have been amazing. They did so much to help me deal with the cancer, such as showing me what food is the best to eat during chemo, how to handle make-up and skin care, and even providing a place for me to have a cry.